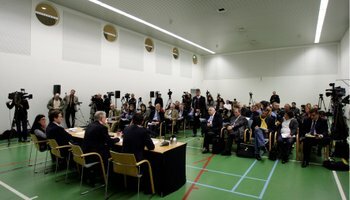 ASSOCIATED PRESS The media gather for a briefing in the gymnasium that will be converted into a courtroom for the Special Tribunal for Lebanon convening next week in Leidschendam, Netherlands, to investigate the 2005 assassination of former Lebanese Prime Minister Rafik Hariri. UNITED NATIONS | The U.N. Tribunal for Lebanon faces an early test after it opens on Sunday - whether Syria will cooperate in the court's probe of the 2005 assassination of former Lebanese Prime Minister Rafik Hariri. The tribunal is expected to start its work by asking Beirut to extradite to The Hague four senior Lebanese security officials held in domestic detention facilities for more than three years. The court is likely to make similar requests of Syria - where some officials are considered prime suspects in attacks on Mr. Hariri and at least a dozen other anti-Syrian writers and politicians in Lebanon. "I don't think there will be trouble" with Lebanon, court registrar Robin Vincent told the Al Arabiya satellite television channel. "The tribunal will file a request to the Lebanese authorities to receive all documents [related to the investigation] and the detained men two months after it starts work," he said. But Damascus, which has already balked at cooperating with investigators and halted interviews with Syrian witnesses and suspects, is going to be a more difficult matter. "All I would say is there has been a sad experience with that in the past with other tribunals," Mr. Vincent said. "In some cases it's taking a fair amount of diplomatic pressure, negotiations, cooperation behind the scenes." Syria, which is on the U.S. terrorism list, denies any involvement in the death of Mr. Hariri. The tribunal - whose personnel and rules reflect a hybrid of Lebanese and international law - is charged with hearing cases against those believed to be involved in the February 2005 car bomb that killed 23, including Mr. Hariri, and injured dozens. In addition, the tribunal will be empowered to pursue subsequent attack cases if the targets appear to be politically chosen. Nations on the U.N. Security Council have said they believe there is a link between the Hariri assassination and several subsequent car bombings, apparently aimed at writers and politicians. Syria has repeatedly said that it will prosecute Syrians in its own courts, rather than turn them over to the tribunal. The tribunal, which will be housed in Leidschendam, a suburb of The Hague, will likely bring to a new boil the tensions between those Lebanese who believe Mr. Hariri was killed on the orders of Syrian officials, and those who are sure the assassination was connected to domestic issues. The trial chamber will be open on Sunday, but court officials indicated that the day would be largely ceremonial and that substantive work won't begin until March. 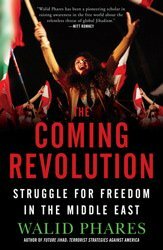 The Hariri bombing touched off the "Cedar Revolution" with national demonstrations, some demanding Syrian soldiers leave Lebanon, and others - mostly supporters of the Shi'ite Hezbollah group - demanding that they stay. Tensions are so high that witness protection programs are in place. The panel of judges has not been publicly named, and even donor countries are hoping to keep their contributions secret to avoid further politicizing the high-pressure endeavor. The tribunal is expected to cost about $51 million in its first year and as much as $45 million in subsequent years. When fully operational, the tribunal will have 11 judges, including four Lebanese ones.